Everything you need to know now is in this book. You can literally read BEATING DIABETES in 30 minutes or less and actually remember what you have read. “I couldn’t believe that I never really understood what Type 2 Diabetes was… until I saw the easy to understand chart in the book. This has been a real awakening for me.” – A. Matthews. 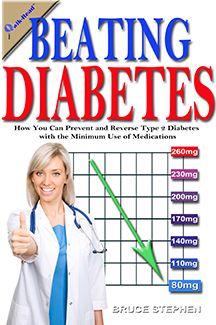 What makes BEATING DIABETES: How You Can Prevent and Reverse Type 2 Diabetes with the Minimum Use of Medications – a must read, when there are literally hundreds of books about Diabetes available? The Qwik-Read™ System is the answer. Qwik-Read™ allows the reader to see the important points in easy to read info-graphic lists. No more wading through 100s of pages of detailed information that slows down your need for answers now. If you want to be successful in your quest to prevent and/or reverse Type 2 Diabetes, you need to find the facts now – without wasting hours researching the index or TOC for that vital info that will change your life! √ Where does glucose come from? √ Is the Pancreas the only insulin producing organ? √ Why is a non-animal protein diet the best for Diabetes?